For amusement and interest, in the last couple of months I have been running two reader Not-A-Polls in the sidebar concerning Tasmania's current Liberal ministry. As the usual disclaimer goes, these not-a-polls are completely unscientific and represent only the opinions of those site readers (or random ring-ins) who may have chosen to participate. Polldaddy has more advanced protections against multiple voting than the native polls on the Blogger site that I used to use, but I suspect they could be routed around if anyone was truly determined. Also, this kind of exercise is especially prone to a word-of-mouth stack, where someone tells a bunch of their friends who would not normally read this site to vote on it. Indeed there seemed to be something of that sort going on in the final week when there were sudden large gains for both Will Hodgman as best and Guy Barnett as worst. Anyway, the following are the results for the Best Minister poll (in order), the Worst Minister poll (in reverse order) and a final ranking based on net scores (best minus worst) with position difference (best minus worst, 9 points for best on each scale to 1 for worst) used as a tiebreaker. Had I used position difference to rank the results with net scores as the tiebreaker, the final order would have been the same. A Queensland state poll by Galaxy, published in the Courier-Mail, tells a story that should have both major parties quite concerned. If this poll is correct and typical, it is 1998 all over again and a bit more. Perhaps the current One Nation polling bubble will burst before an election that is possibly still most of a year away. If it doesn't, then a weakened minority government facing an unpopular opposition presents a dream scenario for Australia's number one nineties nostalgia party to break through at state level and obtain some serious power there. Whether it would manage to remain remotely united this time if it did, nobody knows. The high One Nation vote should be considered no surprise following polls showing the party at 16% in Western Australia, 16.3% in NSW and 9.4% in Victoria. Queensland always was the party's strongest state. It's possible even that the figure is an underestimate, but I am not that convinced that One Nation voters are all that shy anymore. Sample size issues aside (and I haven't seen the sample size for this poll yet) there is one big reason to treat this poll with unusual caution. It comes during a lousy news cycle for the government following the resignation of Transport Minister Stirling Hinchcliffe in response to a damning report on the failings of Queensland Rail. I would expect that event to be deflating Labor's primary vote, and everything I say below should be taken with that caveat. 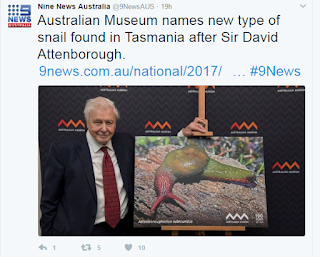 This is only slightly related to politics - in the sense that it is a good example of how media coverage often misreports and sensationalises environmental stories - but I thought I should just correct the record on the prominent announcement of a "new" Tasmanian snail. It isn't a new species and it wasn't discovered in December 2016 as many sources are claiming. What has happened is that an existing species has been moved into a new genus. Sometime in the late 19th century, pioneering Tasmanian land snail expert William Frederick Petterd collected some snail specimens near Eaglehawk Neck. Doubtless noting that some of them were much larger than a species considered widespread through the state, Petterd left an enigmatic (and for me at least illegible) note with the specimens, but did nothing further with them. Live specimens of the snail were first collected in the early 1970s resulting in the description of the new species Helicarion rubicundus by Dartnall and Kershaw in 1978. At the time this was treated as a fresh discovery of a new species, Petterd's earlier specimens having not been noticed. It is one of nature's most amazing seasonal events. As wildebeest migrate in vast numbers, as salmon throw themselves up rivers then spawn and die, so each February on the continent of Australia, a federal government disintegrates. At least it seems this way, with polling for the incumbent government of the time having gone pearshape around this time in six of the last seven years. Usually the causes for the downturn have been extremely obvious. In the longer term this hasn't been such a thing, with average 2PP polling in February since 1986 (49.4% for the government) being only a point worse than those polls taken in January (50.4%) and no worse than polls taken in June and September. But just in recent years there is something about the annual reopening of Parliament that tends to bring with it the smell of chaos. What is happening with the current government is not (yet) as bad as the Week From Hell experienced by the Gillard government in 2013, but yet again we find a government under assault on multiple issues at once. By any normal measure the Colin Barnett Liberal government in Western Australia is in its final weeks. A weak economy, long incumbency, federal drag (and from an unpopular federal government at that), disunity, a disliked Premier and bad 2PP polling would together spell "GAME OVER". It's actually not easy to find electoral precedents for a government with quite so many things against it all at once. The close nature of some recent 2PP polling, however, has given some (but not all) Liberals serious hope that they can sandbag their way back into power, especially if they can get One Nation preferences. The latest Newspoll has, for now, pretty much pulled that rug out from underneath their feet. It's much too early to say that it's all over, but things do not look good.